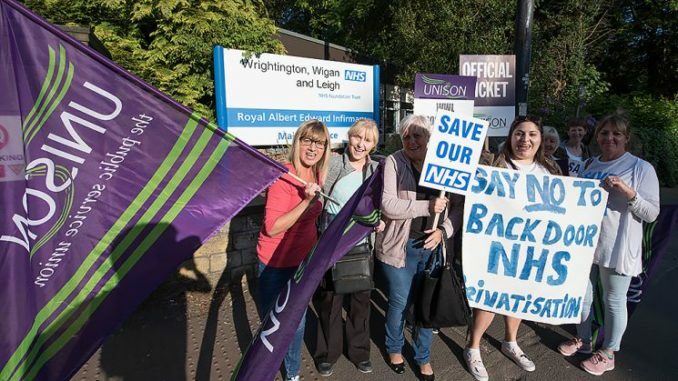 The battle to prevent nearly 900 staff at the Wrightington, Wigan and Leigh Trust being outsourced to a private limited company (“WWL Solutions”) has been won. The Trust, like many others exploring similar plans across the country, hoped to save money in part by exploiting a tax loophole that allows them to avoid VAT, but also by planning to employ new staff on non-NHS terms and conditions, creating a 2-tier workforce. The hiving off of NHS staff into these ‘subcos’ has rightly been branded as privatisation by the back door. Existing staff transferred would be dependent on TUPE protection of their pay and conditions and lose access to the NHS Pension Scheme. TUPE protection itself could be set aside after the transfer is complete, by a company that would be free to make its own policy. If it acts like privatisation and stinks like privatisation, it IS privatisation. 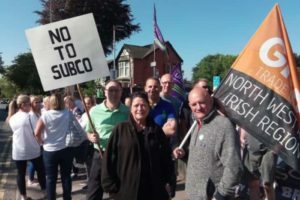 Soon after UNISON had given notice of a further seven-day strike beginning on July 17, an intervention from Wigan Council’s leader and deputy led to a £2m financial offer to the Trust to compensate for the savings they expected – on condition the subco plan was permanently ditched. Trust and unions accepted. Just a week before this retreat the WWLFT Board decided on June 27 to ignore the strikes and press ahead with the plan. The message must now ring out loud and clear: where these plans are fought early enough, hard enough, and long enough they can be defeated – wherever they appear. In Bristol prompt, early action by unions quickly forced a subco plan to be dropped. 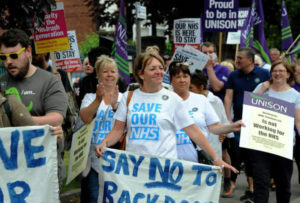 This latest, hard-won victory only came after three periods of industrial action taken by UNISON, Unite and GMB members, including porters, cleaners, catering staff, electricians and plumbers employed at Wrightington Hospital, Wigan’s Royal Albert Edward Infirmary and Leigh Infirmary. Strikers have been driven by determination to protect their terms and conditions and the living standards of future generations of hospital staff, and to keep the NHS team together. They received tremendous support from people who care about the future of the NHS right across the country, as well as senior national and local politicians and union leaders. However this victory still has not yet won the war: most regions of England still have trusts planning subcos, with particular concerns in the South West and Yorkshire and Humberside where a significant number of trusts are proposing to transfer hundreds of staff outside the NHS. Campaigns and ballots for action are also in full swing in several trusts. All will now draw strength from this victory – and step up the fight to keep staff 100% NHS. Exactly what has been agreed is still unclear. Wigan council’s chief executive is also the Accountable Officer of Wigan CCG , and an enthusiast for ‘new models of care’. We must be mindful and alert of new developments in this case – but for now we can celebrate holding the line.